All images courtesy of 903 Brewers. Since surfacing in Sherman during early 2014, Sasquatch sightings have become a regular occurrence around North Texas. Sightings of the beer from 903 Brewers, that is, as opposed to the manifestation of some mythical creature. Then again, a guy in an ape-like suit has played a part in the story of both beverage and beast. Thankfully, though, a reliance on fuzzy photographs isn't necessary to identify what's arguably one of the area's more recognizable beers. "Sasquatch is the beer we're known for," says Jeremy Roberts, co-founder of 903. "That's thanks to winning a silver medal for the beer at the Great American Beer Festival, winning back-to-back medals at the U.S. Open Beer Championship, and being named one of the top ten stouts brewed in America by Beer Info." Nowadays, Sasquatch is more a family of beers, rather than a single, solitary beast. 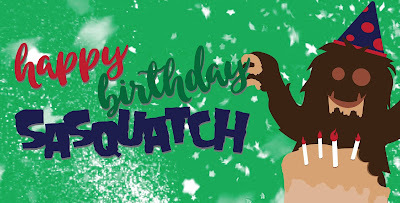 It can be found seasonally in different forms, including Winter Sasquatch (with holiday spice), Birthday Sasquatch (with fudge and toasted marshmallow) and Barrel-Aged Sasquatch. Of course, those are just the Sasquatch siblings you'll encounter out in the wild. Small-batch offerings have emerged from time to time at 903's taproom, and just last summer the company starting bottling varieties to be sold as brewery exclusives. "One of the reasons we converted to a brewpub license was to be able to do brewery-only releases," explains Roberts. "Plus, Sherman is a beautiful one hour drive north, and we want people to come see us. Brewery-only releases have given more people a reason to visit, which is what we want, because we're excited about converting the old Lee School building into our future taproom." Coffee Coconut Barrel-Aged Sasquatch, Scotch Barrel-Aged Sasquatch, Red Wine Barrel-Aged Sasquatch and more. Right: Special glassware available to those attending Sasquatch's Fourth Birthday Party on Saturday, February 3. Along those lines, 903 announced a new line of brewery exclusives in early January. The series, which will be doled out individually over the course of 2018, consists of beers like Barrel-Aged Maple Sasquatch, Coffee Coconut Barrel-Aged Sasquatch and Barrel-Aged Birthday Sasquatch. Those beers and others can be obtained by way of the new 903 Bottle Club, with memberships available at shop903.com. Joining the club provides members with guaranteed access to a total of eight specialty beers (all packaged in either 22-ounce or 750mL bottles), not to mention exclusive glassware and a year's worth of discounts on brews purchased in the taproom. Consumers can also get a taste of the three beers mentioned above by making the trip to Sherman this weekend for Sasquatch's Fourth Birthday Party. Going on Saturday from 12-5 p.m., the event will also feature a tapping of two other Sasquatch varieties: IronRoot Republic Barrel-Aged Sasquatch and Barrel-Aged Sasquatch with cacao nibs and vanilla. No ticket is needed to attend, but you'll want to arrive early for a chance to pick up special Birthday Sasquatch glassware. As for what the future holds for Sasquatch and its brethren, rest assured there are even more varieties in the works. "We have a new beer coming out called Friday Slide," reveals Roberts. "It's Sasquatch aged in Jack Daniel's barrels with coffee liqueur and Irish cream." Look for that brew to arrive in March.